After going back for so many times for a Hong Kong Vacation, I developed these few questions which help me to plan my Hong Kong Vacation ahead of time. At the end, I get more out of it time-wise and money-wise. 1) Why are you going to Hong Kong? For vacation and fun? Business? Transit? Shopping? Or other reasons? There are tons and tons of Chinese Mainlanders coming to Hong Kong just for shopping because they know that they will always find good deals and trust-worthy services and quality. Also, if you like to shop until you drop, consider bringing an extra and/or expandable luggage with you. If not, use the Hong Kong Post Office to help you. Always check on the weather at the time of your Hong Kong vacation. This helps you to plan what kind of clothes to pack. My husband and I went back 2 times exclusively for my sister and my best friend's wedding receptions. I will share with you later my experience of planning of those 2 trips. My uncle and aunt came back in 2009 to check out real estate in order to find out if moving back to Hong Kong for retirement will be an option for them. What kind of entertainment they should expect if they move back? As China becomes more and more influential in the global economy, many people consider to study here so that they can learn the language, at the very least. 2) Who is going with you? When I toured with my family in the States, I realized that different people have different interests that need to be accommodated accordingly. And if you have a family like me, you may want to consider a plan to make everybody happy. Like my 2 youngest sisters they LOVE to eat, or as Perry calls them "Eating Machines". They are very skinny. But their mouths are non-stop. One of my sisters' husband is a vegetarian. So, dining out is quite a challenge. Maybe, you need to do some homework on the Hong Kong food. My one sister and my mom love to shop and find good deals. My other sister is not a shopper, but a museum-goer. She can spend 2-3 hours in a museum very easily. Living in Hong Kong, she goes to museums all the time. She went to a few of them more than once because of their special exhibitions. Maybe, like her, you want to check out the history, customs, lifestyles and cultures through different Hong Kong attractions. Do you have (small) children? Maybe, they want to have some fun in Hong Kong Disneyland and Ocean Park. For instance, we knew that toddlers need to take a nap during the day. We brought along an umbrella stroller with us every day during our visit. It came in handy. On the same token, we experienced flight cancellation and delay every time when it came to international travel. 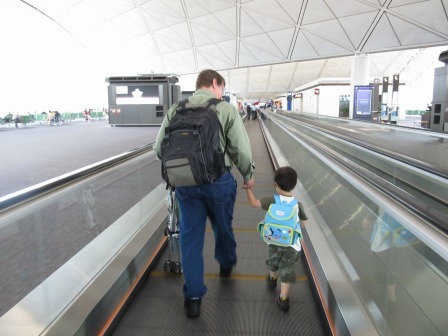 The stroller helps if you need to run from one terminal to another. With a backpack having 2 straps to secure the stroller when you don't need it is another bonus. If you need to bring a laptop along, a laptop backpack is a no brainer. 1) a portable DVD player in case we got stuck in the airport which will keep the child busy. 2) a set of child headphones for the DVD player. We also used them during the flight because those in the plane are not kids-friendly. 3) a child aviation restraint system which is a safety harness that you do NOT need to carry your child's carseat throughout the trip. To us, this is an AWESOME product. 3) When are you going? How long will you stay? Different seasons, of course, will have different prices for the flight and hotel . But also, you will expect different activities, such as festivals and shopping seasons. Some special events could only be found out through mass media, such as newspaper and radio. There were a few times during my Hong Kong vacation with my family, I found out some special events, such as the Chinese wedding dress exhibition and Chinese lantern exhibition, only through the Hong Kong newspaper a day or 2 before the events. Plus, the weather will affect what clothes you want to pack with you. I, personally, like to go back for Hong Kong Vacation between January and February, even though we always experience the flight cancellation and delay. But it is mainly because I can celebrate my mom's birthday and Chinese New Year which is always around the corner. It does not mean that this is the best time for you. 4) What other purposes/goals you want to accomplish during this Hong Kong Vacation? I always make sure to have a dentist appointment and get, at least, a year's supply of contact lens because the doctors are better and it's cheaper over there. I sometimes need to take care of my Hong Kong legal documents. I will put this into my schedule as well. 5) Where else do you want to go? My uncle and aunt always make sure to have a short trip to Mainland China to visit her family. Perry and I like to check out Macau and/or Mainland China during our Hong Kong vacation, if time is available. In this case, do you need a Hong Kong travel visa ? Hong Kong is the Asian hub. With so many travel agents in this city, are you thinking about going to other nearby Asian countries as well? Before I had my child, I always went to either Mainland China or Macau for a short trip. In my opinion, if you fly from anywhere other than Southeast Asia, you may want to consider checking out other nearby countries. In the long run, this saves you a lot in airfare. However, with my little kid right now, I just go to Hong Kong because of his security. I would rather wait for at least another 3-4 years before more exploration of other countries. 6) How much will you spend other than air tickets and hotel? To be conservative, we take public transportation (such as buses, trams and MTR ; not taxi or mini-buses), eat fast food during the day and dine in decent restaurants at night, shop for souvenirs at about US$10/person for 5-8 people and not many admission fees do we pay. It uses US$2,000 easily for a 10-day Hong Kong vacation. Those 10 days do not include your time spend on the plane. Will you use credit card or cash? Credit cards are acceptable almost everywhere in Hong Kong. But you still need to have some cash with you just in case or for taxi. After the first 2 trips, Perry and I realized that we are better off to get cash over in Hong Kong instead of here in the States. It is because Hong Kong currency is not common in the States. On the other hand, you can exchange almost all currencies in any Hong Kong banks with a better rate. If you don't have time to line up or they close, you can go to an ATM machine to withdraw the money. It's everywhere. That's what we have been doing since 2005. But if you are from different countries, the currencies may be more accessible with a better exchange rate. So, exchanging it in Hong Kong may not work for you. You may still want to ask why it is so important to answer those questions. If you can take a few minutes and think through them, you can prioritize stuff and save money for your next Hong Kong vacation. I told you we went back 2 times for wedding receptions. The first wedding, Perry wanted to order a tailor-made Suit to attend the wedding. At the same time, I wanted to go to my dentist for a regular check-up, get a year's supply of contact lens, renew my Hong Kong driver's license, passport and Chinese visa that I need for going to Mainland China. Wow....sound like a very busy schedule. Not really if you plan it ahead of time. We did all of the above in the first 2 days of our Hong Kong vacation. For hitting so many places within a short period of time, you will need a map to help your planning? I highly recommend you to use electronic devices to do so. Why the first 2 days? Because you want to allow some time for yourself in case you need to go back for a follow-up appointment, fitting or take time for them to get the stuff ready for you to pick up. The rule of thumb when it comes to the government is to line up in front of their offices before they open. This is always a winner because you can get out of their office in under 2 hours of waiting time and enjoy the rest of the day. Doctor offices usually open around 9-10am. Stores always open at 11am or after. If you have a deadline, make sure to communicate to the officer, tailor, doctor or whoever, they are always happy to accommodate your needs. Trust me, they do. So did I get everything done on time in that trip? ABSOLUTELY. It took 3 days for the tailor to complete Perry's suit. I got my visa through their "express" service which allowed me to pick it up later in the afternoon on the same day of application. The dentist didn't need me to go for another follow-up appointment. They will send my driver license to my mom and she mailed it to me later, also the passport. My contact lens were ready for pick-up 4 days later. We went to Mainland China for just 2 days with 2 great tour guides (My sister and brother-in-law). After the first 2 days, we were so relaxed, visiting and enjoyed our Hong Kong vacation.